AS the final whistle approached on another tempestuous Wear-Tyne derby, it was Alan Pardew doing his best Sir Alex Ferguson impression, pointing frantically at his watch as Sunderland’s supporters urged their team on to victory. However, the moral victors of this draw were undoubtedly Newcastle United. Games settled like this are supposed to feel like wins for one side, defeats for the other. Sunderland have been here before, snatching an undeserved point on home soil in January 2011. Rather than take confidence from a lucky escape, the Black Cats seemed to dwell on the fact they had again been comprehensively outplayed by their friends to the north. It is now down to Martin O’Neill’s famed powers of psychology to ensure they take the opposite view of the same result. Both sides needed this game to be the spur which takes their season from so-so to something a bit better. Pardew must use it to add to the aura of derby-day invincibility Newcastle have built over the last two years. Whether the Magpies feel it or not, their neighbours do. There was no credit to be taken from the stands, where both sets of fans let their clubs down with vile chanting apparently inaudible from the technical areas. For Newcastle, though, there was only pride from the way their ten men banded together for an hour after Cheick Tioté’s red card. “I can’t take any negative at all,” Pardew declared afterwards. For Sunderland there needs to be serious rethinking. Since these teams were reunited in the top flight three seasons ago, they appear to have developed a massive derby hang-up, but their problems go far deeper. They can be found in the three players behind centre-forward Steven Fletcher. Adam Johnson, James McClean and Stéphane Sessègnon are supposed to be the creative heartbeat of the Sunderland side. If that is the case, O’Neill’s next purchase should be a defibrillator. An unbeaten start to the season only ended at Manchester City two weeks earlier has camouflaged a timidity laid bare yesterday. The trio have suffered from it, but also contributed. Sessègnon’s early exit from the last derby was a mortal blow to Sunderland’s chances of victory. This time it significantly enhanced them. Had Louis Saha not put a great chance from an 83rd-minute corner into the side netting, his introduction could have been declared an unqualified success. As it was, in 25 minutes against his old side, the Frenchman was of more nuisance value than Sessègnon has been in this entire stop-start season. O’Neill said at the end of pre-season he was unconcerned his brilliant No.10 had not played a minute of it. Yesterday, he admitted it had been a problem. Sessègnon looks rustier than Saha’s hairdo. McClean and Johnson were no better. Neither has hit his stride this season. As he grew more and more frustrated, McClean’s only impact looked like being the kind of hot-headed rashness he normally reserves for his Twitter feed. 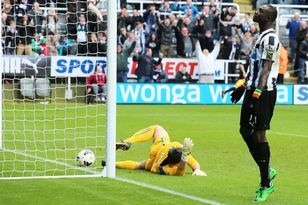 He could at least lay claim to his side’s only effort on target – spilled by Tim Krul, directed wide by Saha at the far post. Johnson was just as anonymous, a shot which failed to curl inside the far post on 33 minutes virtually his only contribution. He can point to injuries as an excuse. McClean looks to be suffering a severe bout of second-season syndrome. The whole team seems to be in the grip of something psychosomatic. They look like scaredy Cats. O’Neill may have bought the players to counter-attack but they seem petrified to do it. His team-mates give Fletcher a wider berth than the kid at the school disco with bad BO. The Scot must have been more pleased than anyone to see Saha coming on. At last, some company. However, counter-attacking was not what was called for once Tioté (pictured left) was sent off after 25 minutes. It ought to have signalled the start of a game of defence-versus-attack. With Shola Ameobi replaced by defensive midfielder James Perch, the remaining hour would be decided by the answer to one question: could Sunderland break Newcastle down? On their own they could not. Demba Ba’s own goal was as unexpected as it was undeserved. Things will get tougher for Sunderland before they get easier. From the next five games, the only ones at home are another derby – against Middlesbrough in the League Cup – and a game against an Aston Villa team packed with players O’Neill signed and managed by some he mentored. The trips are to Stoke City, Everton and Fulham. Pardew could be much more upbeat about Newcastle’s immediate future. He said: “We spoke in the dressing room about kicking on now.